This is one if the latest felted Druid bags to be finished. The other two are top secret for another five days. I didn't intend to make myself a bag this week. This is not the time to craft for myself, I have gifts to make, a new business to prepare for..... however, this bag had plans of its own. 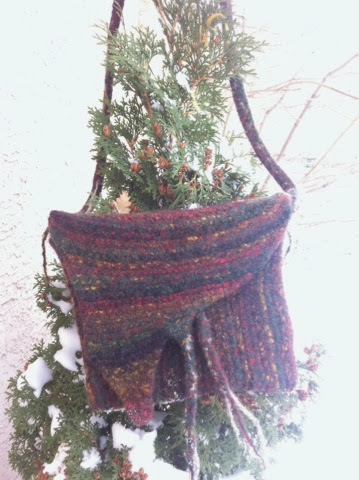 After it was knit and felted, it started to speak to me, " I should be yours", "you need a druid bag to show people, in person" and the most compelling of all "you can decorate me" ... well, as the title of this post shows, this druid bag is MINE. Now, to change wallets, and get ready for the Solstice Celebration tonight, “MANTRA” Christmas and Winter Solstice Celebration!. Enjoy the Winter Solstice everyone! Follow Feather Storm's board Crescent Moon Collective on Pinterest. Paulus Berensohn - Hand Crafted Journals and the power of ART. 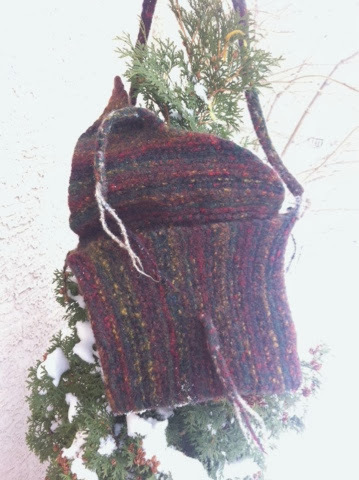 Is my knitting in tune? What does one do while waiting in the car? The paint is drying on my frame drum! © 2013 - 2015 Crescent Moon Collective / CMC Is protected under copyright and trademark laws. Any reproduction is strictly forbidden.